This is a record where it is a truism to say that it a record of two halves. It is constructed as such with Josephine taking on writing duties for the first half and Minnikin picking up the baton and driving home the second. Josephine mainly sings her songs and Minnikin his, so they sound different and they have different sensibilities too; and there’s also a yawning gap in terms of quality. 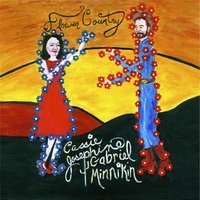 Josephine has a pretty voice and her songs are serviceable genre pieces – The Price and others draw heavily on classic country tropes. There’s a lot to like about the songs. I Don’t Want To Go Anywhere is a slow-burner that nudges towards excellence but for the vocals. The same charge can be levelled at Through The Blue; Josephine doesn’t quite have the personality in the voice to convince. Minnikin’s songs are immediately different, more substantial. The arrangements are denser. St Genevieve glides on waxed rails of pedal steel and some strings, pushing it in directions that pull the ear along with it. That being said, Good Listener does lean on traditional Country and the delightful Princess of BelleAire is a pedal steel driven duet that feels like a song that’s been around for years. The closer Maid of Honor has the feel of the late lamented (by me) Sackville in its slow-motion Countryness, the song wavering like an aural mirage. Josephine would perhaps be better served by a separate release; here Minnikin whose pedigree and experience makes everything he does seem so effortless, simply overwhelms her.